The house, which has been renovated and extended in 2001, is connected to mains water and electricity measures 197 square metres of footprint and has land measuring 3600 square metres. The house has 3 bedrooms, with laminate floors, one family bathroom with a shower, a bidet, a sink with cupboard underneath, and a toilet, one kitchen, and a big living / dining room, with tiled floors and patio doors to the garden. Although they have kept some of the original and traditional features of the house, like some exposed wood beams, and the original fire place in the kitchen, there is a modern central heating system installed that heats all the rooms of the house. There is a second kitchen that can be accessed from the garden, as well as a second bathroom with a toilet, a shower, a sink with cupboard underneath and a hydromassage bath. There is also a barbeque area and a storage room, as well as a garage, where the machines for the central heating are. There is a 4.5m x 6 meters swimming pool with a patio around and an outside shower. Behind the pool area there one other building with 6 x 10 meters, at the moment used for storage and workshop, but that could easily be converted into more living accommodation. Wooden houses: There are 3 fully furnished wooden houses in the property included in this asking price. This houses are completely independent and have good rental potential as they are very private. 1st house sleeps 2, the 2nd house has 3 individual beds, and the 3rd house has a double bed, and a sofa bed, a dining area and sitting area, this one has an air conditioned unit. The property comes with 3600 sqm of land, with several different mature fruit trees, like plum, fig, cherry, apple, pear, lemon, peach, and vines, as well as several olive trees. There is bore hole and a water storage tank for irrigation purposes. 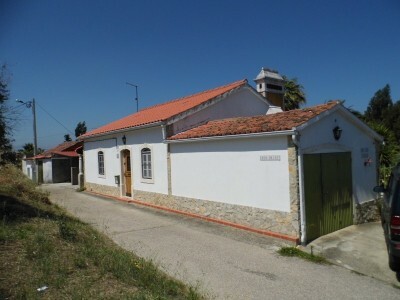 The House is situated in the small village of Pero Calvo, which has a cafe. The popular and bustling town of Tomar, which is home to the UNESCO listed Convento do Cristo, is around 10 minutes drive from the cottage. Tomar has a range of supermarkets, shops, cafes, restaurants, bus and train station, cinema, bowling alley and library as well as pharmacies, banks, schools, hospital and weekly market. The closest airport to the property is situated at Lisbon, which is around one and a quarter hours’ by car. Lisbon airport is serviced by a variety of low cost airlines, which operate regular flights into and out of the United Kingdom and other European countries.